With the end of Time Force, the series took a transition period, where the rights to the series transferred to Disney. At first, Disney were hesitant to continue the series. Wild Force - the last of the Saban seasons [at least until they got the rights back] - showed Disney that the series was still popular, and with the the ability to reduce costs by moving production to New Zealand, meant the series could continue. However, history lesson over, as these two seasons offer something different. 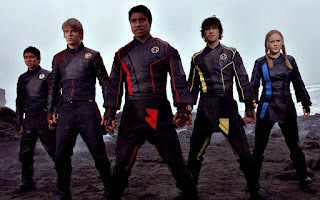 Wild Force was an interesting season for me, but Ninja Storm is where I felt the series really starts to pick back up, so read on and see just what I think. Wild Force’s opening feels similar to Lightspeed Rescue, in that it introduces elements but tells very little. We see Cole in the jungle, preparing to follow his destiny. We see four Rangers in a fight that’s pretty muted on audio, with just a few grunts and punches. They get beat due to facing two orgs at the same time, and say they need a leader. Taylor, the Yellow Ranger, is the least accepting of this. Cole comes across the city of Turtle Cove, and after rescuing some animals from cages, gets ‘recruited’ to the Rangers. In other words, Taylor knocks him out and he awakens on a floating island. The only two things Cole has to follow his destiny are a red orb and a photograph of his family. 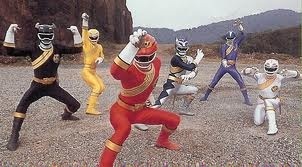 The other Rangers have similar orbs in their respective colour. Cole is red, Taylor yellow, Max blue, Alyssa white, Danny black. The orgs are back, and the five combine weapons to defeat one of them, the second goes supersize thanks to help from Toxica and Jindrax. The Rangers call the Wild zords, and combine weapons again to defeat the second. And the opening episode ends there. Further episodes expand on what was seen. Cole tries reasoning with a new org, only to realise they have no hearts. Master Org has returned, and the pollution of the Earth is bringing new orgs to life. The Animarium, where the Rangers and Princess Shayla live, is the floating island, and though the events that led to current events are true, for regular citizens they have been reduced to fiction. And Taylor starts warming up to Cole as the leader. Throughout the opening episodes, there feels a more lighter tone that covers the episodes, and certainly more comedic parts than the more serious seasons. Taylor is certainly the strongest character from these few episodes, with Alyssa a close second. Taylor, being the longest serving Ranger, is more knowledgeable of the mission, watches out for the others, and is protective of both. Alyssa is more thoughtful, and while the other Rangers are full-time, Alyssa still finds time for her studies at the university. And through the university field trip, she uncovers the fact other Wild zords still remain – hidden. She bonds with one - the elephant - and it becomes a great asset in fighting the supersize orgs, giving the Megazord a sword and shield. The giraffe is revealed to Max, and Taylor helps two brothers, who turn out to be the bear zords. Our villainous team haven’t really done all that much except for Toxica’s musing of why Master Org looks so different. When the Red Lion is hurt after an overload of power when using the bear zords, the Soul Bird enters the picture and Master Org stops Cole from gaining access to it. He manages to knock Cole out, but also remembers something from the past upon seeing Cole’s family photo. It seems there is human in Master Org after all. Master Org’s former bodyguard Retinax returns to provide the first real challenge to the Rangers. In my eyes though, it faked out in handling that defeat. Megazord frozen, along with their morphers and crystals, those crystals are then taken by Retinax, Toxica, and Jindrax, only for the crystals to instantly be returned once the Soul Bird egg releases its magic sound. Everything unfreezes and the crystals return to their owners with no fight needed, not even a simple kick to the wrist. However, the Lone Wolf arc, as I call it, starts next, and provides a bit more story than what’s been given so far. Its first episode does a better job of presenting a challenge than what Retinax did, with General Nayzor rising to resurrect the wolf warrior. Throughout the episode is a sense of foreboding evil rising, even as the Rangers battle an Org in the usual light-hearted fashion. When that evil rises in the form of Zen-Aku, he knocks the Rangers out one by one, and takes the elephant crystal. Zen-Aku is hate-filled due to something the Rangers did to him 3000 years ago, though these Rangers were different warriors. Princess Shayla knows something, though is unwilling to say anything. Zen-Aku’s memory is locked, so he only knows of his mission but nothing more. Toxica and Jindrax are trying to one-up Zen-Aku and please Master Org by getting the animal crystals of the Rangers. While they try for the Giraffe, it is Zen-Aku who manages to claim it. While comedic moments are still showing themselves, the arc itself is gearing up for something serious. As each crystal is taken, the episodes want an emotional response from the viewer, as it builds to what comes next. As the battle between the Rangers and Zen-Aku continues, the zords he has claimed are turned dark and used against the Rangers. The mystery of who he really is gets revealed – that being Merrick, the sixth ancient warrior. With the bears zords also under the control of Zen-Aku, it seems that all is lost. The Bison zord calls for more help, which gives the Megazord a real kick. The final confrontation is built up well, even if it does have a faint scent of finishing things due to not being able to stretch the confrontation any more. The final episode of the arc is still a strong finish though. Merrick feels he is unworthy to join the Rangers, and can’t understand why the other Rangers would forgive him so easily for all Zen-Aku did to them. The episode deals with him trying to get the crystals that are now under control of General Nayzor. Those four crystals have been transformed into an org, the Red Lion feels Merrick has proved his worth in battling that org, and he is granted the Lunar Wolf Ranger powers. In the end though, despite returning the crystals to the Rangers, he still isn’t wanting to join them. Merrick finds a place to stay, and after joining the Rangers for a fight, says that while he’s working with them, they don’t have to be together all the time. In a way, I think he’s just trying to resist the temptation of love again. He and the Princess were close 3000 years ago, after all. More history of Cole’s family is revealed, and Master Org has some connection with them. It strikes a sad feeling to see the graves of Cole’s parents, but as Taylor says, Cole’s name is also on them, so it’s possible his parents survived. Jindrax and Toxica find out about this history, so Master Org puts a spell on them to make them loyal again. It gives them new forms, but as we’ll see later, it just takes one well-placed strike to remove them. The more side episodes [I’d never call them filler] offer some more character building, and we see how Max was recruited to the Rangers. We also see again how being Rangers is affecting their other lives - the time before they became Rangers. This is also shown through another focus episode for Danny as well. Alyssa’s past with her father is explored, as is a bit more of the relationship between Merrick and Princess Shayla, in the form of the deer zord, which the two used to sing to. Alyssa’s episode is a good one, but I felt too much importance was placed on the song itself in the deer zord episode [though what can you expect when the episode’s title is Sing Song]. Though I have to admit the song itself was good. Master Org brings Nayzor back, and the Rangers have a real tough time defeating him. With just Cole and Merrick left, the other Rangers are in some sort of dream world, where they have to solve a puzzle to release a missing Wild zord. That zord is the Falcon zord, and with it comes the Falcon Summoner and the Animarium armour. Cole puts them to good use – first defeating Nayzor with the Summoner, then taking out Jindrax and Toxica with the armour, which restores them back to normal. My favourite arc of Wild Force has to be Reinforcements From the Future, as it captures the essence of what made Time Force so great, while not forgetting that it’s a Wild Force arc. The Silver Guardians - with Eric and Wes - are introduced, and we can see the respect these two now have for each other. Character interactions are at an all-time high for Wild Force within this two-episode arc, and the plot manages to expand on Time Force. Mut-Orgs, as they are known, are the threat, and there are three of them. The first episode builds them up as a threat, with the second part being the one that deals with them. Ransik set the three orgs free, and they copied his mutant DNA to become Mut-Orgs. Now he wants to atone for his mistake, as well as everything he ever did. This appeal is mostly to Jen, who still seems to have trouble trusting him. As the two teams work to stop the plan of Master Org and the Mut-Orgs, those Mut-Orgs attack Wes, Cole, Ransik and Nadira. Ransik makes a sacrifice by destroying their mutant DNA, and the two teams combine [with Merrick joining for the final battle] to take them out for good. With the Mut-Orgs defeated, Ransik’s own mutant DNA destroyed, there’s time for celebration and seeing the two teams have fun. Eric also seems to have found someone he likes, as Taylor seems a match for him romantically. With a great pace throughout, great interactions and introductions, and some great battles, this really is one of the best episodes of Wild Force for me, as well the best team-up so far [though that might be tied with another team-up that’ll show itself next time]. Cole’s family history is revealed by Master Org, who as we’ve seen before isn’t an Org, but a human. The human, moreover, who was their friend. He betrayed them when he started feeling he was being shunted aside from everything. When he found the remains of Master Org, he used them to exact revenge, but Cole remain alive and it had eaten him. Poisoned him, as Cole put it after their confrontation. And that fight had a good amount of fire in it. This is a personal grudge, but when it came to the final moments, Cole wasn’t falling to Adler’s level. He wasn’t going to get revenge. Jindrax and Toxica have been searching for a new Org General, and as Adler’s Org powers are wiped, Mandilok is the highest rank of Org around, and takes over for a while, doing what Cole refused to in dealing with Adler. Mandilok revives two Duke Orgs, and starts tearing the city apart. The Rangers do battle against the three. Starting with this episode, we are introduced to a boy who calls himself Kite. He doesn’t remember much, but this starts off an arc that takes up a few episodes, showing Kite reacting to certain things but not understanding why. Princess Shayla and Merrick finally have an understanding, and the two become friendlier to each other because of it. The friendship of Jindrax and Toxica is always welcome to see, and there feels a slight building up to something between them as that friendship gets a bit more focus. Kite reveals himself to be Animus, and feels that humans are destroying the planet. Thus, he takes the Wild zords from the Rangers. Again, this feels as though it’s building up to something, as they are returned next episode. That’s not to say it’s bad, as the two episodes are well constructed. Forever Red, the tenth anniversary episode, has been said to be the best of the anniversary team-ups. It certainly featured quite a number of elements that celebrate the series. Jason, Tommy, TJ, Andros, Carter, Wes, Eric, and Cole join together to take out the remains of the Machine Empire, who have uncovered Serpentera. Leo and Aurico join later on for the morphed battle. Bulk and Skull cameo, the Astro Megaship and an Alpha-series robot are shown off. It all feels forced, in a way, but still doesn’t have an effect on how it plays out. I can’t exactly say whether it’s my personal favourite anniversary episode, as I feel there’s an episode from Dino Thunder that does a much better job - while not necessarily an anniversary - of being a celebration of Rangers. The end is nearly upon us, and the villains get one on the Rangers. Their first visit to the Animarium to capture the princess fails, but the second succeeds. However, betrayals happen, as the Duke Org Onikage was secretly working for a revived Master Org. Toxica had her horn removed so the sacred water wouldn’t affect her, but in doing so weakens her. As the Rangers try to take out Mandilok, he uses Toxica as a shield that destroys her. Master Org takes out Mandilok, then commands Onikage to take out Jindrax. With Princess Shayla now in Master Org’s hands, the Rangers plan to get her back. As I said, the relationship of Jindrax and Toxica got a bigger focus, and here it comes into full effect. Jindrax is at a loss for what to do, which is shown well [aside from the comedic relief], and strikes a sad note. As he brings Toxica back, the happiness he feels can be felt. The two decide to join the Rangers and rescue the princess as a favour of forgiveness. At first they’re doing it just for themselves, but find the heart to help. Master Org has performed a ceremony, giving him unlimited power. While I loved seeing what Jindrax and Toxica grew into, it feels that is the only part I’ve really been enjoying, aside from a few select arcs. And with the final arc, I don’t know what to think. Master Org has an Org Heart, which means he can be resurrected with each defeat. He uses that power to jump onto the Animarium, and destroys all the Wild zords. He then heads back down to the Earth to cause havoc while the Animarium falls to the Earth. With no powers, the Rangers still make a stand. It’s a very emotional ending, even though it has to be the biggest cop-out of an ending I’ve seen yet. Even with no powers, the Rangers are still willing to make a stand, so every single zord – even those destroyed in the previous war – return to destroy Master Org once and for all. That emotion continues with the goodbye Princess Shayla gives the Rangers, who give up their powers to return to normal life. The Animarium is then returned to the sky, and Alyssa gives the final narration to end the series off. Ninja Storm dials back on more serious elements for a more playful feel. It still retains depth in later episodes, but for the first episode, the focus is on the characters and setting the series up. Prelude to a Storm works quite well, showing each of the main three in what they do best, before bringing them together for ninja training. Tori likes the water, being a great surfer. Shane likes to gain air with his skateboard. Dustin is a motocross bike rider. The three don’t do so well at ninja training, and also showed up late. If they don’t improve, the sensei will expel them. Lothor arrives, and captures everyone of the Wind Ninja Academy. Everyone except the sensei, his son, and the three late arrivals. However, a history between Lothor and the sensei is hinted at, and as revenge, the sensei is turned into a guinea pig. Against Cam’s better judgement, the sensei makes Tori, Shane, and Dustin Power Rangers. The episode does a lot to set the characters up, and future episodes expand on what the hints gave out. The focus episodes show the three overcoming a flaw in themselves – or at least becoming aware of it. Shane tackles the idea that he needs his team in the episode that introduces the zords and Megazord. Tori feels she needs to improve her looks, but comes to realises she is fine the way she is. Dustin finds he needs to prove he is dedicated to the cause when he starts spending time with Hunter and Blake – two motocross riders who came from nowhere. These two are important in the next arc, and in a way they have been active already. Lothor has two Thunder Rangers, and they have been active behind the scenes. In the episode Thunder Strangers, they get in on the action. They’d already taken the data for the Tsunami Cycles, and built their own. They also have their own zords, and battles on foot, with bikes, and with zords happen. 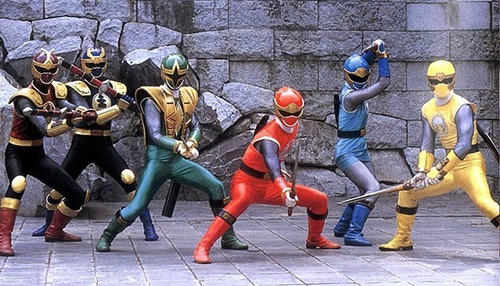 The second episode has a trap set, allowing the Thunder Rangers access to Ninja Ops – the Wind Ranger’s base. Inside, they take Cam, and reveal themselves as Blake and Hunter. While the episode has been setting them up so it’s not a dramatic reveal, the effect on the characters is more important. It’s still built up well, with Shane the least trustful of the two, and several other factors that clue people in. The two release Cam, as they have something else – Cam’s father. The two ninja schools battle it out for the Wind Sensei, who has encased himself within an orb, and at the Cavern of Spirits, Blake and Hunter’s parents appear to tell them the truth. All this time they were exacting revenge on the wrong person. Of course Lothor would try and spin the truth to put himself in a good light. With that, the Thunders leave, not wanting to stay or atone for what they’ve done. However, that’s not the last we see of them. Two episodes are entertaining side attractions, though one does reveal a bit more about Cam and his relationship with his dad. Cam’s getting frustrated because he can’t be doing what he wants – being out with the Rangers. A hint at what’s to come later on is that Cam will be trained in a way other than that of the ninja. Hunter and Blake return, and Choobo – one of Lothor’s minions – exacts a plan to bring the two back to their side. Shane is again the least trustful of them, and that is proven right. However, the memory alteration the two are under doesn’t seem powerful enough, as they hesitate a few times. Choobo uses some magic to send all five of them to a sinking island, where they do battle while trying to escape. The two overcome the memory alteration, so instead of setting them on the Wind Rangers, they are set on each other. Some toxic steam on the island strengthens the alteration, and with Blake now with the Wind Rangers, and the island’s sinking causing the world to freeze over, the four need to reverse both. Blake takes on Hunter, and that is effective in showing the bond of the brothers. Hunter is able to overcome the alteration, and joins with the others. On the side, we’ve seen Cam trying to locate the Rangers, and while he does manage to find and contact them once the particular thread of the plot is over with, it’s still been built in a semi-believable way to not feel too much like a cop-out. Since Choobo’s plan failed, and Lothor wants him gone, he takes it out on the Thunders. As it turns out, the two Megazords can combine, and when Choobo goes supersize, that is put into action to finally put him out of action. With Hunter and Blake now fully joined with the others, the arc comes to a close, and after two more episodes, a new one begins. One thing I need to mention is how much the music has changed back to rock. It started with Wild Force, though there was occasionally some orchestral music still within, which ties in with the confused identity. Ninja Storm goes full-on rock, and I feel it fits. The season does focus on extreme sports after all. Samurai’s Journey is focused on Cam, and his desire to be doing something more. A new monster has robbed the Rangers of their powers, and even a power boost cannot protect them for long. Enter Cam, who wants to help, and when his dad lets slip about a power from the past, that is where Cam will go. He experiences his family’s past in his quest for the powers – the fact his dad has a brother, how his mother and father met – and comes to realise the powers he needs come from his mother’s samurai amulet. That amulet is stolen and Cam is accused, but his dad finds out his brother was the one who stole it. Cam gets into a fight, and the amulet chooses him. His dad’s brother is cast out, sent deep into space, and with a new name. Lothor. When Cam returns and defeats the supersize monster that was causing the Rangers trouble, he does so as the Green Samurai Ranger. Lothor gets a bit mad, and tries to take the six of them down. Intent on taking Cam out, Lothor launches an all-out attack with five monsters, launching a sixth once the others are occupied. Cam’s still getting used to the Ranger powers, and ends up being stung with an insect toxin. With numerous battles happening, the end of this arc sort of loses something. Focus is still on Cam, but with its need to follow all the battles in some form, only the middle part when no battles are taking places holds any real value to the story. Cam creates a virtual replica of himself, though it has a few faults at first. Not least because it ties him up and takes his place – not that it does a good job of that. Now that Cam’s a Ranger, they needed some way to let him hang with the rest of the team, and this makes sense within the world that’s presented – what with teleporters and holo-projection being shown as usable from Ninja Ops. There are quite a number of side episodes before some more arcs happen, and they present some interesting concepts, whether that be Lothor presenting his own TV show, or a body swap episode – but this time sensei taking the place of one of the Rangers. These still show a decent amount of character, and it’s these moments that really make the episodes. One particular episode has Marah and Kapri trade the monster controller to someone on Earth, with that boy using it and the Rangers battling monsters to have them disappear on them. Hunter comes to the rescue, and the two have a bonding moment. Another bonding moment happens between Dustin and Marah, who has been cast out when her friend Beevil takes her place. Now, the episode does well to never reveal the twist until it needs to be done, and that makes the whole interactions between the two all the stronger. The episode before some new arcs come into play introduces a new toy for Hunter. It’s almost as though it’s preparing for getting back to the main story, and the monster shown in the episode is ready to return later on. Shane been having bad dreams and it’s Tori’s birthday. The perfect day then, for things to get out of hand. Zurgane unleashes his own zord on the city as a bounty hunter searches for his prey. That prey being Skyla, a mystical being who has returned to hunt Shane down and offer him thanks for helping her when he was a boy. Shane protects her from the bounty hunter, and she transfers her power to his morpher. That power enables the Battlizer, which Shane uses to great effect to defeat the bounty hunter. As the season hits the last ten episodes, it goes through some hit or miss moments. On the one hand, Shimazu Returns has some good action and at least sets up the last quarter of the season. On the other, it seems to have lost some of the depth that the first half did so well. Though to be fair, that was already starting to drop off during all those side episodes. Motodrone, the monster set up to return, does so here. Cam and Motodrone fight over a box which Cam was tasked to collect. Cam wins the day, but Motodrone uses leftover restorative power on Shimazu, an ancient warlord whose spirit was contained. Both join with Lothor, and Shimazu calls his Wolfblades to attack. The Rangers manage to beat them, but the three Wolfblades join together to form a supersize monster. This introduces the Mammoth zord, which is used to take it out. Thankfully, while the next episode is a side episode, it’s one of the more wackier ones. Tori finds herself in a dimension where everything is reversed. Lothor and his minions are the good guys, while the Rangers terrorise the city Mayor Lothor has worked so hard to build. It’s entertaining to see the reversal of roles. Blake also finally manages to get the words out in saying he likes Tori at the end of the episode as well, once she’s returned and is telling him the story. Episodes about facing fears can usually be hit or miss, though this one mixes it with some good character interactions between Shane and his brother. Things are starting to get really final, as the generals under Lothor start plotting on their own and intend to one-up each other. Zurgane uses a new power to pirate the Ranger abilities into his new zord, and it appears it will succeed. However, the Rangers win, as always. Just why this was a two-part episode, when it could have been done as one, is because of showing the back-stabbing nature of one in particular. Throughout, Vexicus – the bounty hunter from before – had joined with Lothor. He plans, as is shown a lot during this episode, to watch the other generals fall and take the top spot for himself. It’s already been raised at points during the previous episodes, but since one general is to fall, it needs a lot more exposure for some reason. Of course, Zurgane was still standing, so Vexicus took care of him. Lothor’s army is one general down, and that just sets the rest to fall throughout the last four episodes. The next general to go is Motodrone, who knows of Vexicus’ plans. Cam’s plan to rescue all the ninja students who were taken by Lothor is interrupted by Lothor himself, but Cam knows what needs to be done for a repeat attempt. Marah and Kapri get in on the action, teaming up with Shimazu to try and take the Rangers down. With three zords, the fight is tough, but the Rangers take all three down. Marah and Kapri take Shimazu out the same Vexicus did Zurgane and Motodrone, and as it turns out the two have been in on Vexicus’ plan all along. The Storm Before the Calm arrives, and Marah and Kapri have been double-crossing Vexicus. The ultimate plan of Lothor is at hand, and it is revealed he has been following the Scroll of Destiny, which he took before his banishment. However, it seems to be missing a piece. The Abyss of Evil is close to breaking open, having been fed with the souls of all the evil that has been destroyed. When Vexicus gets destroyed by the Thunders’ sacrifice of their zords, it cracks. Lothor takes a visit to Ninja Ops, having sabotaged the… well, let’s just say emergency back-ups should not be placed outside of a secret entrance. After trashing the place, he takes Cam back to his ship, the plan so very close to succeeding. Sensei has returned to normal, thanks to Lothor accidentally reversing the magic when he attacked, and as the Thunders head out to rescue Cam, sensei shows Shane, Dustin, and Tori that they were destined to be the ones to stand up to Lothor. Lothor has the Samurai amulet, and leaves his ship with it set to self-destruct – Marah and Kapri still inside now he no longer has any use for them. Inside another zord, he uses the amulet’s power to fully open the Abyss, bringing forth the evil. The Wind Rangers sacrifice their zord to destroy Lothor’s, and a battle ensues. As they get surrounded, the Thunders return with Cam, all the captured ninja students, and Marah and Kapri – who Cam rescued because they are family. The evil is destroyed, leaving just Lothor and the Rangers. Lothor takes their Ranger powers, but using their ninja powers, Shane, Dustin, and Tori send Lothor down the Abyss, causing it to implode. Everything is back to normal, though Blake takes on a career with motocross rather than return to the Thunder Academy. Marah and Kapri join the Wind Academy. After the greatness of Time Force, it is hard to think where to place these two. I don't use other seasons or episodes to rate the one I'm concentrating on, but the fact remains that neither hits the greatness of Time Force in my eyes. Wild Force feels confused on tone at times for me, and it doesn't help that I never felt entertained too much by most of the episodes. Ninja Storm did better, but while it started strong, that blank period of side episodes - while entertaining - felt lacking in other areas, and the ending felt too focused on Megazord battles - an area of most seasons I feel could be done better overall [then again, I also feel strong reliance on Sentai material never does well, which all zord footage falls under]. However, I can with confidence place them fairly accurately. As you can see, currently my top five has always been changing, but with the introduction of Dino Thunder and SPD next time, it will be staying pretty static from that point on. 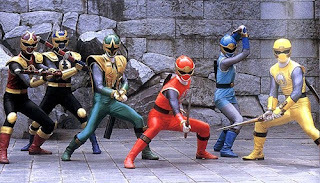 I'm not saying too much, but The Disney Brain on Youtube recently covered why Dino Thunder is a perfect legacy season [having covered Megaforce previously] and most of the points covered in it are reasons why it will be making the top five. As for SPD, it lifts most things from the Sentai and makes me actually like the fact Sentai material is used. Even without that fact though, it's still a great season in its own right.